Rocky Patel Decade Cigars - Buy Premium Cigars Online From 2 Guys Cigars . Perfection takes time. 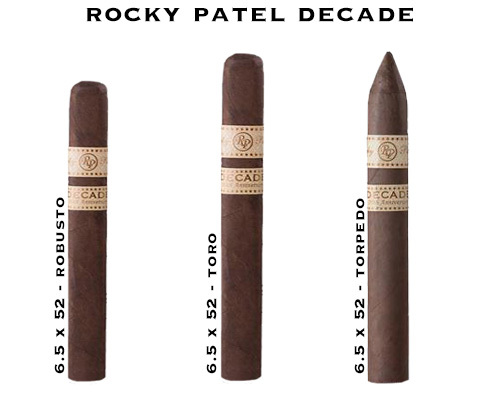 For the Rocky Patel Decade, it’s the perfect blend 10 years in the making. The Decade showcases a rare, gorgeous dark Sumatra wrapper surrounding a secret blend featuring only the finest tobaccos in the world. The result is a rich and toasty medium to full bodied smoking experience with flavors consisting of espresso, dark chocolate, sweet spice, white pepper with a silky smooth finish. Complexity, balance and elegance earned the Rocky Patel Decade a rating of 95 points-an instant classic. Truly one of the best cigars ever made!